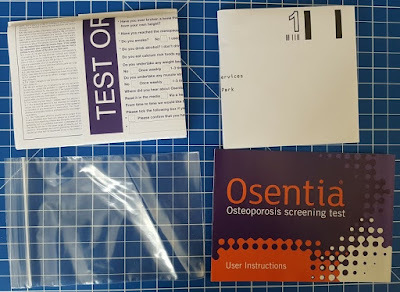 On the day I was turning 45 an email about reviewing Osentia Osteoporosis Screening Test popped into my inbox. At first I ignored it, but I kept seeing it and wondering why I hadn't deleted it, and I became more and more intrigued about what my results might be. I decided it was an omen, so I replied, and a few days later my testing kit dropped through the door. It's got to be fair to say I'm becoming aware of my age, I'm being reminded of every old injury each morning, and I wonder just what pressure my life and my lifestyle has placed on my body over the last 4 1/2 decades. 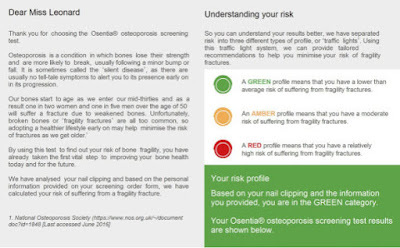 What is my risk of breaking a bone due to Osteoporosis? I've carried 5 children, then breastfed them for just over 8 years in total. I've broken a few minor bones, dislocated my arm and had major abdominal surgery. I've drunk far more than my fair share of alcohol and never had as much sleep or exercise as I should. I've been a vegetarian for over 30 years, and although I do have good understanding of nutrition, you can't help but wonder if any of the people who tell you "you'll never get enough xyz" are right. "1 in 2 women and 1 in 5 men over the age of 50 will break a bone as a result of osteoporosis." "It is estimated that around 3 million people in the UK have osteoporosis. This can lead to bones becoming fragile and breaking easily, resulting in pain and disability. Much can be done to treat osteoporosis and prevent fractures. We are committed to helping people with osteoporosis live the lives they want to lead." If it's something I can help, then I'd be a fool not to find out, and I'm trying to embrace my age rather than deny it, so I took the test. There was a daunting looking form, but it turned out to only be 5 minutes and no tricky questions. I had to cut off a bit of nail, and as all my fingernails were kind of matching for once, I plumped for a toe. You only need a tiny bit of nail, pop it in the bag and send it off. You can choose get your results by email or letter. 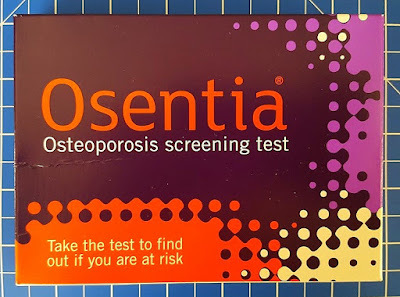 No-one in my family has ever really suffered badly from Osteoporosis. There are a few genetic quirks, colourblindness, dyslexia, arthritis, being very short etc., but I've no memories of broken hips or limbs. I figured inheritance might have provided me with the ability to save enough calcium, Vitamin D and everything else I might need to at least balance out the breastfeeding. I didn't have to wonder very long, because it was less than a week later that I had my results. 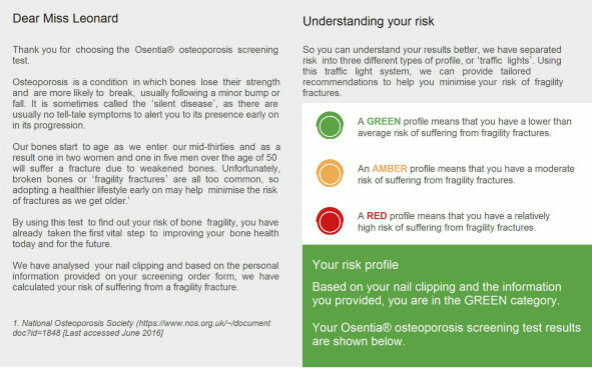 The report also contains tailored advice on managing your risk of breaking a bone, based on your responses to the questions on the order form - relating to alcohol, weight, smoking, family history etc. Everyone who has a risk in either orange or red is advised to see a Medical Professional (Pharmacist or Doctor as appropriate) for advice. I'm an advocate of the NHS, and I think I'd rightly have trouble convincing my Doctor to test me for bone fragility as I've no actual evidence to suggest I'd need it. I am strangely comforted by my results though, and I think if it was something you'd considered before, you had a family history or other risk factors and it might prey on your mind, then it's possibly worth doing. 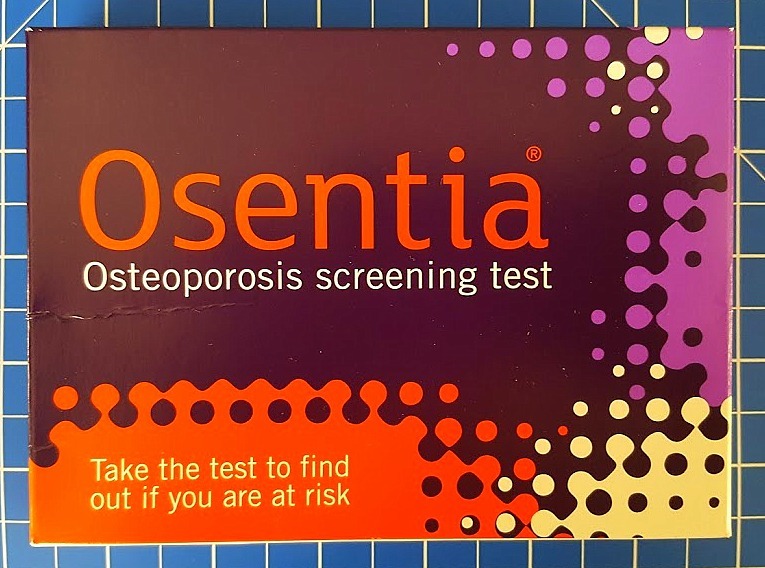 The Osentia Osteoporosis Screening Test is available exclusively at Superdrug and on the Osentia website, and costs £39.99. I was sent mine for review.